A collection of small interface and gameplay tweaks, like no disappearing corpses, overwatch and hunker down delay, soldier gender and nationality, XP and mobility display, abductions in countries with satellite coverage. 04/30/14 - added "Perk Trees Editor for EU". 04/26/14 - "Geoscape Pause on Notifications" mod: fixed Geoscape freeze on notifications while ship is flying to/from mission. 04/12/14 - added EU version of "Class Probability" mod. 04/12/14 - added "Second Wave Options Unlocked" mod by Amineri. 04/10/14 - Nationality and Gender Probability mods for EU and EW. More flexible gender probability settings. 04/09/14 - started a work on EU versions of the tweakers. NoDisappearingCorpsesEU, HunkerDownOverwatchDelayEU, Display_XP_in_Battle and SkipRevealCinematicEU/EW uploaded. 03/17/14 - uploaded a test version of "Nationalities Expanded" mod. More info in [url=http://forums.nexusmods.com/index.php?/topic/1461752-expanding-nationalities/page-4#entry12955693]R&D topic[/url]. 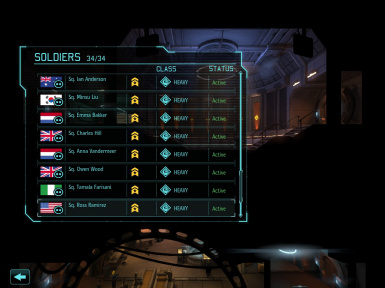 03/15/14 - updated "Soldier Class Probability" mod, see the description for details. 03/15/14 - added new mod: "No Sleeveless Armor". It's similar to "Revenge of the Sleeves" in functionality, but limits all changes to just one specific function and preserves compatibility with "Display Soldier XP in Battle" mod. 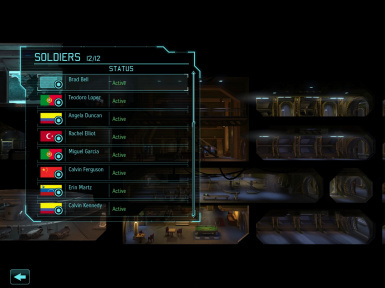 03/15/14 - added a more user-friendly version of "Soldier Gender Probability" mod. 03/12/14 - added "Remove Death Animation Delay" mod by Peasly Wellbott. 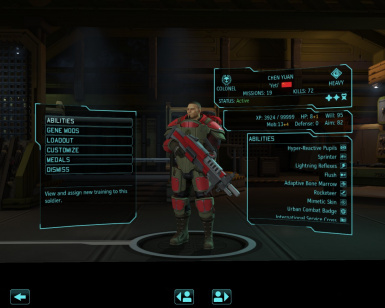 This is [url=/xcom/mods/452]original mod[/url], converted to PatchUPK format for better EW patches compatibility. 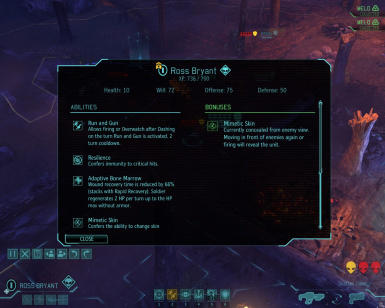 03/02/14 - new mods added: "Soldier Nationality Probability", "Abductions in countries with satellite coverage" and "Soldier Class Probability". 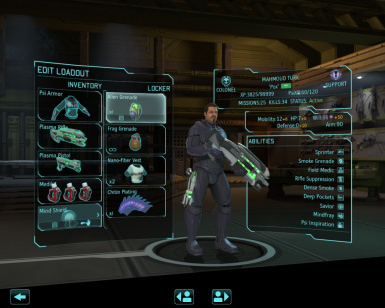 Renamed mod to "XCOM Interface and Gameplay Tweaks". Use PatcherGUI to install. Note, that for XCOM:EU you have to disable hash check before using any of the mods (you need to do it only once, use "Tools->Disable hash check" option in PatcherGUI). Please, remember, that you should install EW mods into XEW folder (under XCom-Enemy-Unknown folder) and EU mods into root game folder (XCom-Enemy-Unknown)! For any mods to work properly, you should move Steam out of Program Files folder!!! 1. Soldier Gender Probability (use EW mod version). 2. Soldier Nationality Probability. As of b14 you can adjust soldiers nationalities via DGC.ini. 3. Adjust Critical Wound Will Penalty. As of b14g you can adjust critical wound will penalty via DGC.ini. 4. No Bullrush (use EW mod version). 5. No Chain Panic (use EW mod version). 6. Display Soldier XP, PsiXP and Mobility in Battle for LW (use special LW mod version). 7. Tone Down Overwatch Sound (use EW mod version). 8. Geoscape Pause on Notifications (use EW mod version). 9. Hunker Down Fine Tune (use special LW mod version). 10. Camera tweaks (separate download, use EW mod version). Some of the other mods may also be compatible, but only the ones listed here were actually tested with LW and reported working. Camera tweaks for EU and EW are available as a separate download: "XCOM Camera Tweaks". 1. "No Disappearing Corpses" — prevents corpses from disappearing by setting internal destruction timer to 7200 seconds (vanilla value is 5 seconds). 2. "Hunker Down and Overwatch Delays" — allows to adjust Hunker Down and Overwatch delays. Defaults are set to 0.1 seconds (vanilla values are 1.75 seconds). 3. "Display Soldier XP, PsiXP and Mobility in Barracks and in Battle" — displays soldier XP, PsiXP (for Gifted soldiers only) and Mobility in character card while in barracks, and in soldier info screen (F1) while in battle. 4. "Remove Death Animation Delay" (by Peasly Wellbott) — prevents units from flinching before they die (EW only, EU doesn't have this bug). Converted to PatchUPK format and now is all EW version compatible. 5. "Skip Reveal Cinematic" — skip pod reveal cinematic (doesn't prevent revealed aliens from moving to cover). 6. "Geoscape Pause on Notifications" — pauses Geoscape after notification pop-up. Works with all events like soldier returning to active duty, excavation complete, ship transfer complete, etc. 7. "EW Hologlobe Rotation Fix" by Amineri — re-enables mouse left-click hologlobe rotation (EW only, EU doesn't have this bug). 8. "Hunker Down Fine Tune" (EW only for now) — brings several improvements to Hunker Down action: Hunker Down hotkey (K by default) now works similar to Overwatch hotkey, i.e. immediately performs a Hunker Down action without a need for confirmation; Hunker Down sound is no longer played twice, resulting in weird echo effect; soldier speech for Hunker Down action is now enabled. 9. "Tone Down Overwatch Sound" — makes overwatch sound less irritating by decreasing its volume multiplier. 1. "Soldier Gender Probability" — allows to set female gender probability to any value between 0 and 100%. 2. "Soldier Nationality Probability" — allows to adjust soldier nationality probability. 3. "Soldier Class Probability" — allows to adjust soldier class probability, takes into account classes of soldiers already present in barracks and adjusts current probability accordingly. I.e. if you have too much heavies, heavy class probability will temporarily decrease. The mod doesn't change vanilla behavior of always giving 4 different classes first! 4. 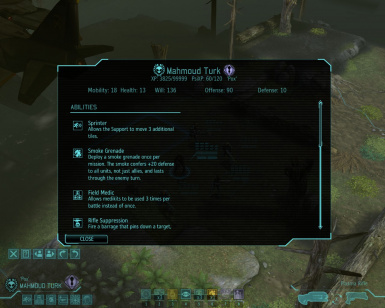 "No Sleeveless Armor" — makes gene-modded soldiers use regular armor (EW only, EU doesn't have gene-mods). Inspired by "Revenge of the Sleeves" mod (by Peasly Wellbott). 1. "Abductions in countries with satellite coverage" — enables abductions in countries with satellite coverage. 2. "Second Wave Options Unlocked" by Amineri — unlocks all Second Wave options. - Patrol distance reduced from 30-45 meters to 20 meters (a bit less than a dash move). - Fixed flanked+overwatched=freeze bug (divide-by-zero error). - Improved overwatch danger zone calculations. - Improved Last Alien Standing AI behavior. 4. "Perk Trees Editor for EU" — allows to edit perk trees for all classes (including psi). 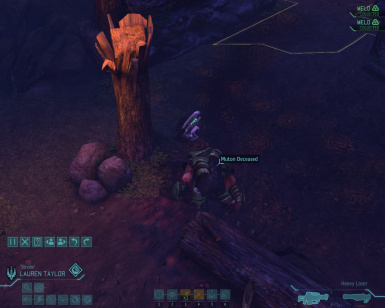 Note, that EW doesn't need this, as perk trees are accessible via DefaultGameCore.ini (see XCOM-HOW-TO). 5. "Adjust Critical Wound Will Penalty" — allows to adjust amount of Will soldier looses when critically wounded (default modified amount is zero). 6. "No Chain Panic" — panicking soldier no longer triggers the panic roll for his teammates. 7. "No Bullrush" — disables Bullrush attack for Berserkers.